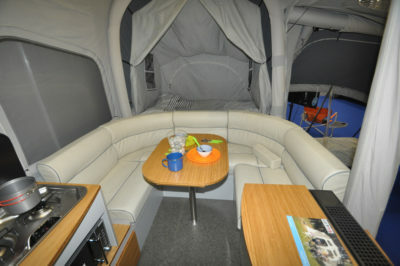 Set it up at the touch of a button, ‘leather’ seats, up to 10 berths, choose your colour…! Caravans a bit bland? Fancy something a bit different? Still prefer the idea of camping under canvas? With a unit that’s simplicity itself to tow and manoeuvre? 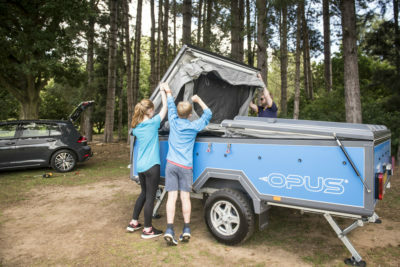 Welcome to Opus, the name behind a stylish take on folding campers. 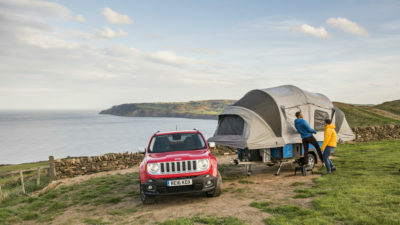 It’s a logical progression, too, that’s taken us from its trendy folding campers models to this, the self-inflating versions that have totally eclipsed their initial, metal-poled stablemates. 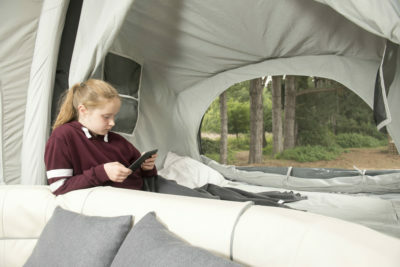 It’s a trend that’s firmly set in the world of tents and, increasingly, caravan and motorhome awnings. 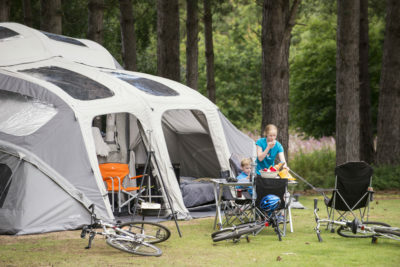 To start, then, there are currently six Air Opus models, priced from £16,495. Most popular so far is the Full Monty version, as here, which kicks off at £17,995 and has a more encompassing specification that extends to faux leather upholstery, heater, microwave oven, portable toilet, alloy wheels and plenty more. It also includes a full awning. 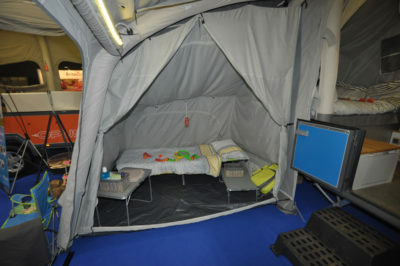 Also inflatable, it seriously ups the ante in terms of extra living space and sleeping opportunities. So, what starts as a four-berth could sleep up to 10, all on double beds! It runs on a braked BPW chassis. There’s a full choice of body colours for the trailer unit, which features an aluminium structure with insulated polycarbonate infills. Its overall size, too, means it won’t be detrimental to your car’s fuel efficiency. So, how does it all go up? Easily, is the short answer. Allow yourself up to 20 minutes, tops. The process starts once you’re on your pitch and have the right orientation (the unit can easily be manhandled by two people). Next job is to wind down the corner steadies, before unclipping and folding out the bedroom sections at each end. Then comes the magic bit – pressing a button will see the whole unit take distinctive shape as the beams inflate via a 12V pump – some two minutes is all it takes, before final construction touches like attaching the bed supports and securing the polycotton canvas. 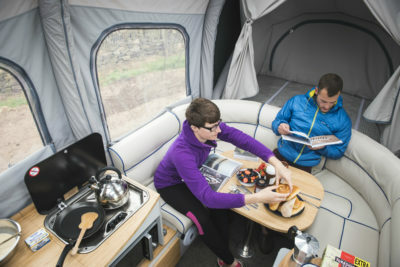 It all offers so much more living space than a typical caravan. Interior height, 2.44m at its maximum, in particular, is generous, also the interior is very light. The distinctive shape and styling are also key attractions, of course. 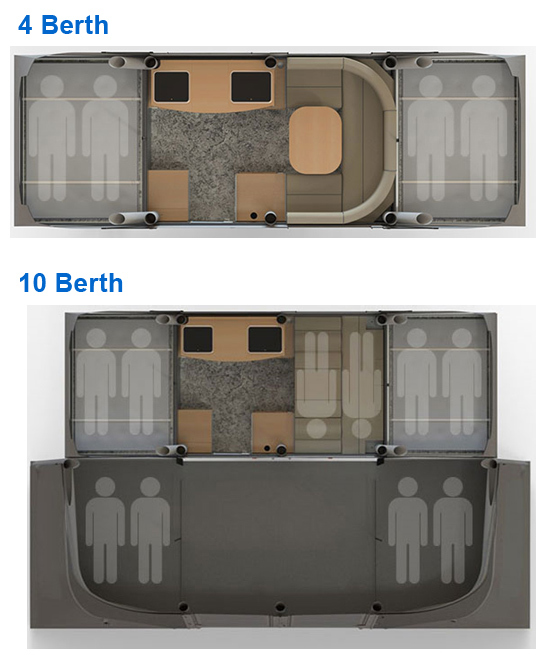 By folding camper standards, it’s a typical enough floorplan, with a central living area and double bed sections at either end. It’s very contemporary, though, thanks to fittings like the bamboo furniture finish. The main lounge is a U-shaped area, with pedestal leg table to your right as you step into the unit. The two main beds are the same 190cm x 140cm in size – it’s just a bit more of a clamber getting over the lounge seating to one of them. 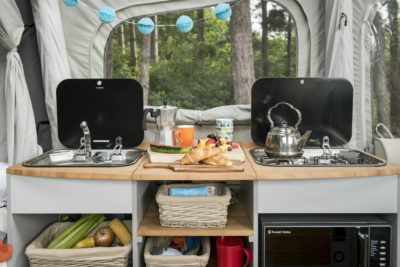 Aside from the extra kit mentioned above, the kitchen offers a two-burner hob and separate sink, with worktop between and lots of storage beneath. There’s a huge range of options, too, going all the way up to a full on-board cinema system just shy of £1,000. That includes several ways of carrying extra items – from bikes to surfboards and more. With that in mind, there’s also the opportunity to up the maximum weight (and therefore payload) – to 1,050kg, 1,250kg or even 1,500kg. Configure it all for yourself on the Opus website. There’s more information on the Air range on the Opus website. To find out more about insuring this or your current folding camper visit our folding camper insurance page. Key options Premium body colours (£999), side skirts (£299), LED awning light (£49), mattress topper (£125), USB upgrade (£25), cinema system (£999), alarm (£49), spare wheel and carrier (£199), BPW stabiliser (£199), thermal roof lining (£15). 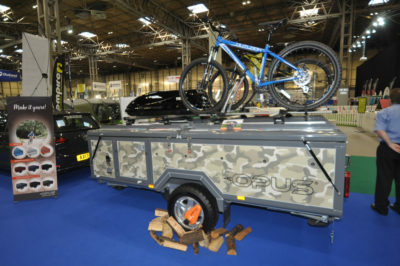 *Folding camper insurance cost based on Air Opus Full Monty folding camper retailing at £17,995 fitted with wheel clamp. Kept on drive at HX4 0BE behind locked gate post. Caravanners over 30 years old, claim free for three years and a member of a caravanning club. £100 excess. 180 days European cover and up to £75 per day for up to 15 days emergency accommodation cover included. Legal expenses cover, extended European cover and other emergency accommodation expenses cover options are available at extra cost. Quote includes 10% online discount and 12% Insurance Premium Tax and is correct as of 4.4.18. Tel: . Email: info@caravanguard.co.uk. We are open 8am - 8pm weekdays, 9am - 4pm weekends & most bank holidays.